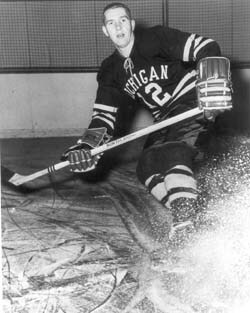 Dale MacDonald, from Saskatoon, Saskatchewan, played for the Saskatoon Junior Quakers before enrolling at the University of Michigan in the fall of 1957. He played right wing for Coach Al Renfrew for three seasons, 1958-1959 through 1960-1961. In his sophomore year, he scored nineteen goals and had nine assists in only twenty-two games. He added seventeen goals and seventeen assists in the next two years for a career total of thirty-six goals and twenty-six assists for a total of sixty-two points. Dale MacDonald was elected captain his senior year and led Michigan to a 16-10-2 record, the first winning season for Coach Renfrew at Michigan and his first Big Ten Championship. Dale MacDonald’s most memorable moment at Michigan was playing against the Russian National Team at the Detroit Olympia Arena in the 1958-1959 season and scoring a goal against the Russians. His most important goals while playing for the Wolverines were in the 1960-1961 season when he scored two goals against Colorado College while being scouted by Tommy Ivan of the Chicago Blackhawks. After graduating from the University of Michigan School of Business Administration in 1961, he played in the Blackhawks organization for Sault Sainte Marie in the EPHL, Calgary in the WHL, Buffalo in the AHL, and then senior hockey once again for the Saskatoon Quakers and new plays Old Timers hockey in Calgary. Dale MacDonald also coached minor league hockey in Calgary from 1971 through 1975.